I will call this as eSIM throughout this page since 'e' can imply many different things(e.g, it can imply 'Electronic', 'Embedded' and even 'Enhanced'). For some people especially who is working on modem development and device testing, it would sound like counter-intuitive evolution path because 'anything fixed/non-removable' may imply 'less flexibility and less controllability'. Then how come this kind of concept is getting more and more frequently talked about (as of Aug 2015). In engineering, for anything coming out anew, there is some reason/motivation. What is the reason/motivation for this new concept of SIM ? I think the biggest motivation is related to M2M/IoT devices. Unlike the mobile phone (Smart Phone), most of the M2M/IoT device is not easily reacheable and even it is reacheable, you may not be able to easily decap and plug in SIM card. So a new idea came out to implement UICC as a fixed chipset attached to each device. If we implement it as a fixed chip to a device, we would come across a big problem. In most cases, you would not know exactly what kind of informated should be stored in the chip(SIM) by the time when the device is manufactured. You would not know which network operator the device is sold to and which location they are installed. So you have to make it programmable, so that we just program it depending on different requirement in stead of changing the SIM card. Is it going to be used only for M2M device ? It doesn't seem to be restricted to M2M/IoT device only and there seems to be some trends towards adopting this technology to mobile phone as well. Read following articles. How to program (provision) the SIM ? Now the question is how you can load information (profile) into each eSIM card within the device ? The simplest idea is to implement a special programming port directly connected to the eSIM and electrically load the information into it, but the ideal (final goal) would be to load the information (profile) over the air (this is called 'Remote Provisioning'). Following is overall Architecture and Information flow modified from GSMA Technical Specification. (I just a couple of items below the dotted line. Everything above the dotted line is exactly same as in GSMA Technical Specification : Figure 1 in GSMA-Embedded-SIM-Remote-Provisioning-Architecture-Version-1.1). Probably the most of the readers including myself are not very familiar with each of these entities for now (Aug 2015) and inter-relations of each of these entities are also quite complicated. Most of the people would be interested (or involved) in only a couple of path shown here. I will just keep updating the descriptions of possible path combinations (interactions) among these entities as I learn along. Probably this can be a kind of minimum functional flow. First, SM-DP should get the necessary tools or services from EUM (eUICC Manufacturer) that is required to program the eUICC. Next, SM-DP should get input data from MNO (Mobile Network Operator) that will be used to create a Profile (or Many Profiles) for the target eUICC. Some examples of the input data are as follows. How SM-SR communicate to eUICC ? How SM-SR can communicate to eUICC ? This is the point that I am personally most interested in (You may be more interested in other parts). This communication is supposed to be over-the-air ? Then you might ask 'what kind of OTA technology' and which specific Radio message will be used to carry these information. I think this should be determined by each MNO and each MNO would use different technology. GSMA Specification mentions of some of possibile mechanism as follows. (In Ref , the section A.2 MNO-SM-DP Interface describes as follows). What is in a Profile ? i) Authentication/Security Algorithm Parameters : Algorithms would be Milenage in most of the live network. or it can be 3GPP Test algorithm if it is configured for test. The parameters would be as follows. As of now (Sep 2015), there is no international standard about eUICC Profile update method that is commonly adopted even though there are some cases where eUICC are used in terms of hardware. So, the use model listed here would be a kind of idea level. Case 1 : eSIM is embedded in the device and IMEI (device ID) & ICCID (UICC Serial Number) is informed to end user (or a specific Service Center). And then, the end user (or Service Center) can ask Network Operator (MNO) to activate of eUICC. 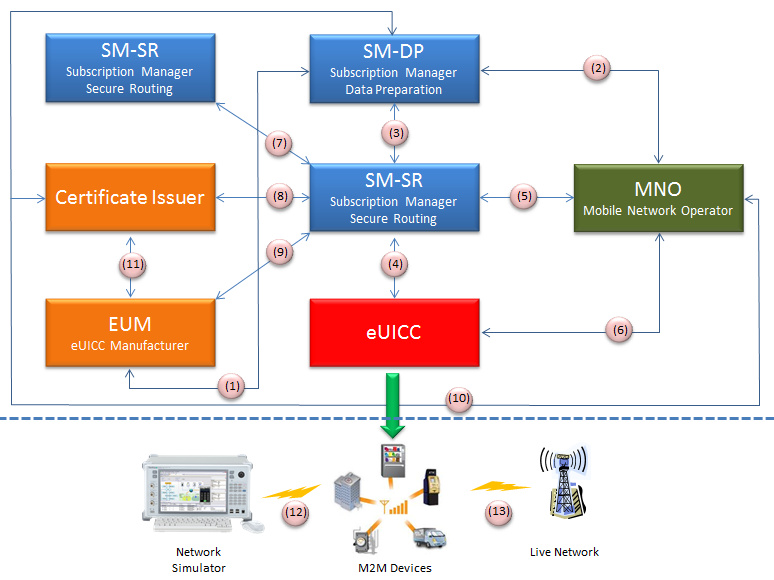 TS 31.102 Characteristics of the Universal Subscriber Identity Module (USIM) application : This documents describes all the parameters and format of UICC parameters.